Pence stumps for Republicans in trip to Kansas City, Missouri – Welcome to Wyandotte Daily! 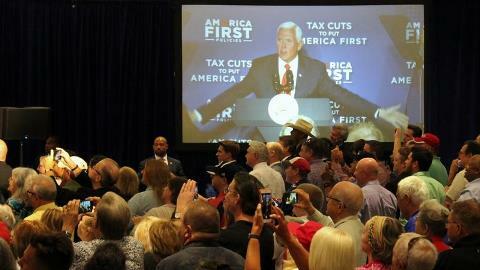 Vice President Mike Pence came to Kansas City, Missouri, Wednesday, where he touted Republicans running for office on both sides of the state line and tried to ease concerns about the Trump administration’s expanding trade war. The vice president voiced his support for Missouri Attorney General Josh Hawley, who is expected to win the Republican primary and take on U.S. Sen. Claire McCaskill. “This is the kind of obstruction that the American people have had enough of from Washington, D.C.,” Pence said. Congressman Kevin Yoder, R-3rd Dist., did not attend the event, but he also was the beneficiary of some kind words from the vice president. Pence held a fundraiser for Yoder earlier in the day. Yoder is facing a primary challenge and a crowded field of Democrats vying for the 3rd District seat. It’s a seat both parties are eyeing as a potentially close race.